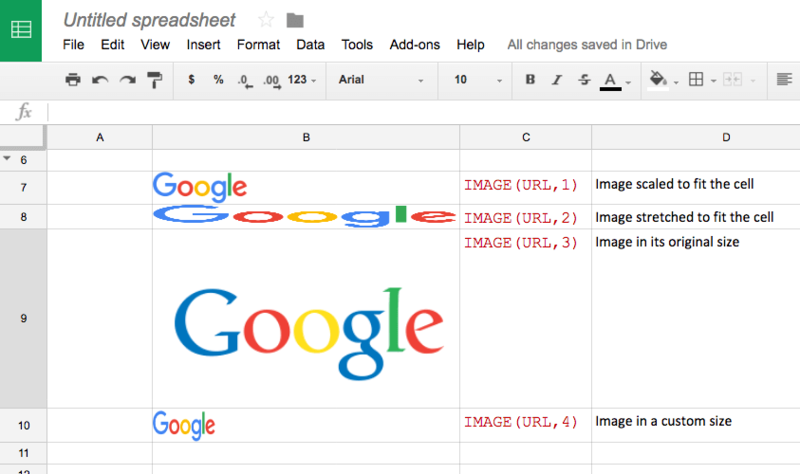 Google Sheets is a great free tool for creating and editing spreadsheets. It allows you to easily work in real time and collaborate with others. 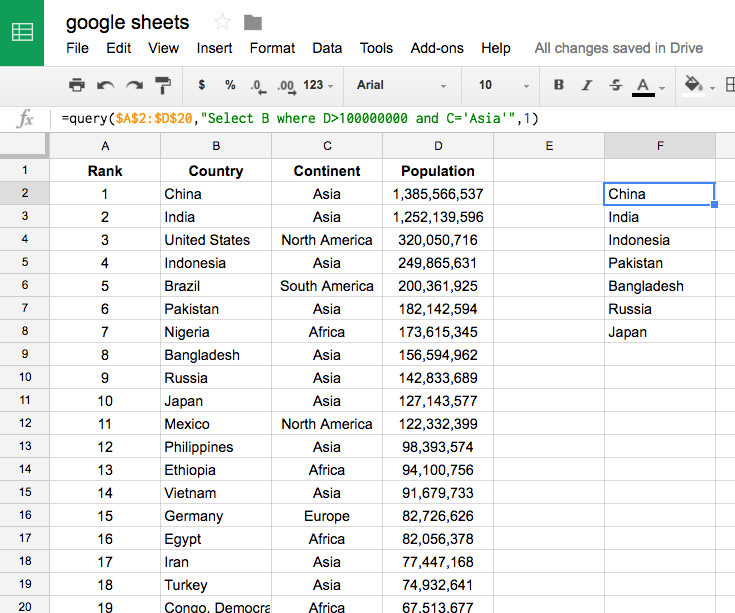 Google Sheets has a lot of features you may not be familiar with that are guaranteed to make you more productive. You may know a few shortcuts like copy and paste (Ctrl + C, Ctrl + V) but there are more powerful commands at your fingertips. Shortcuts that let you move to the next sheet and change data formats, for example. Locate the ‘Help’ menu to learn a few more or check out this list of keyboard shortcuts. 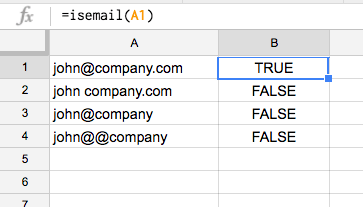 Take advantage of the QUERY( ) function in Google Sheets to start treating your tables like databases where you can retrieve any figure based on SQL code. Query offers all the capabilities of arithmetic functions (SUM, COUNT, AVERAGE) with the filtering abilities of a function like FILTER. To learn more we recommend this article. If you have timestamps in your spreadsheet there is an easy way to remove the time data. Use the INT( ) function to extract only the date portion of a timestamp. 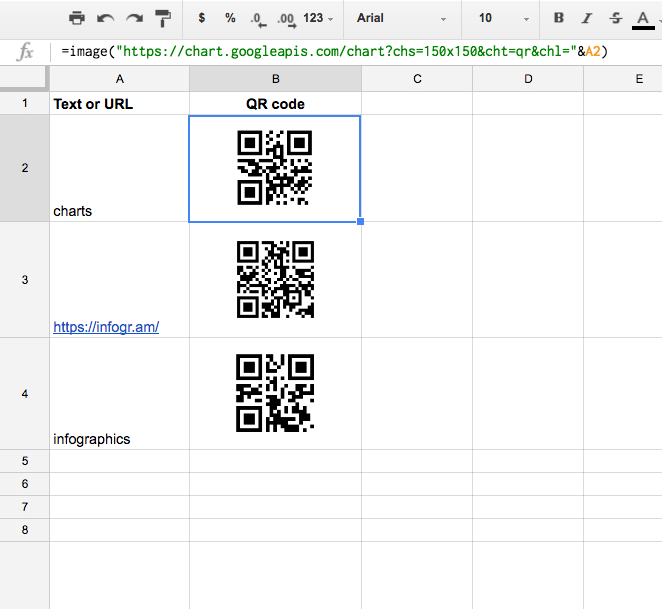 A2 is the cell with the URL or text you want to use to create your QR code. 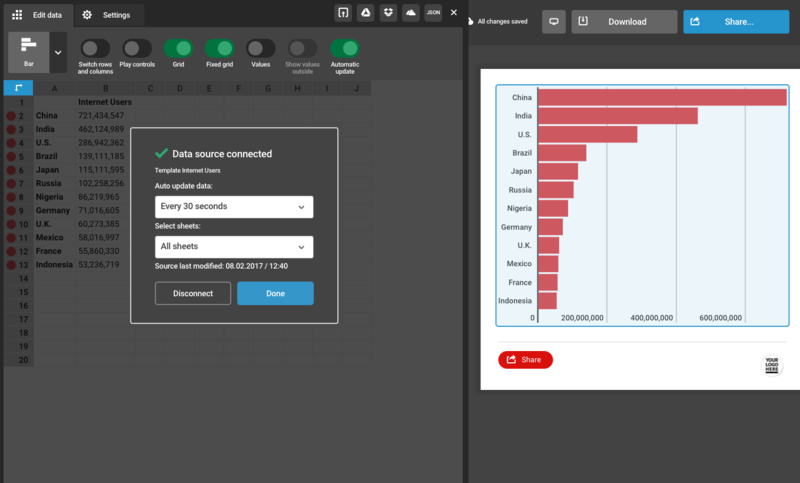 Infogram’s integration with Google Sheets automates the process of adding new data to a chart by updating the data periodically. It is simple to set up, so you might want to try it when designing your next interactive chart or online report. View the tutorial here. The diagram below explains how the formula works. Learn more here. The FILTER function allows you to easily return values from a column that satisfy certain conditions. FILTER can only be used to filter rows or columns at one time. The syntax is: =FILTER(“list of values”, “conditions we’re testing”). Use the function UNIQUE( ) to get a list of unique values from a range or column. 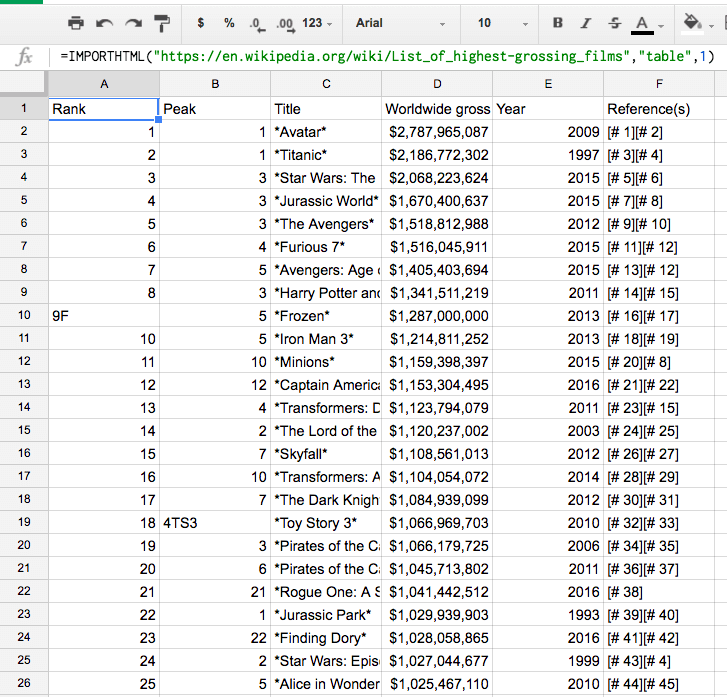 You can access data from a website in your spreadsheet without having to copy and paste using the IMPORTHTML( ) or IMPORTXML( ) functions. Google has a built-in language detector. Use the formula DETECTLANGUAGE( ) and it will return a two letter language code. The full list of language codes can be found here. 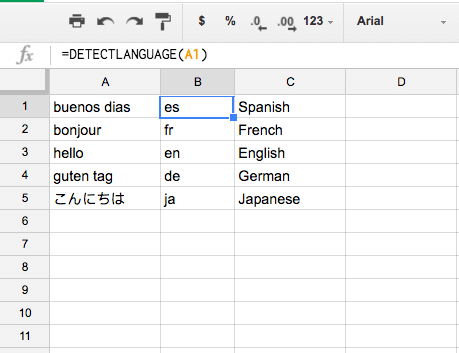 Google can detect a language but also translate from one language to another. 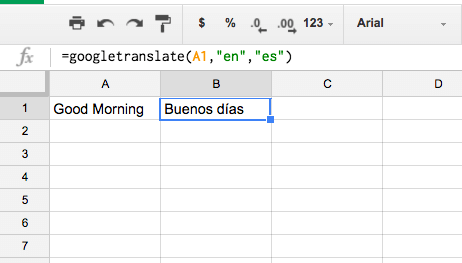 The formula GOOGLETRANSLATE( ) has three parts – text to translate, the current language of the text, and the language you want to translate into. The function ISEMAIL( ) checks to see if a string of text or cell has a valid email syntax. 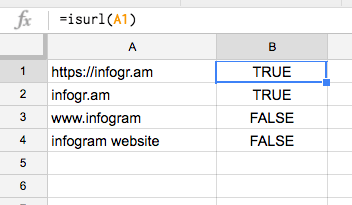 The function ISURL( ) returns true or false if a string of text or cell has a valid URL. The GROWTH( ) function can be used to extrapolate a trend and predict future values. The image below shows the sales of a product over 5 periods. 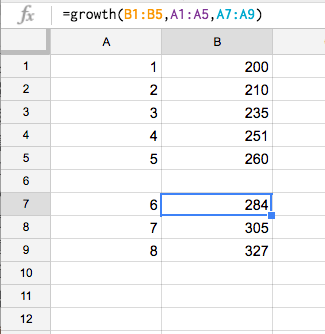 With the formula =growth(B1:B5,A1:A5,A7:A9) you can estimate what the values would be for 6 – 8. Have a long formula? Break it into easy to read lines using the command ALT + Enter. 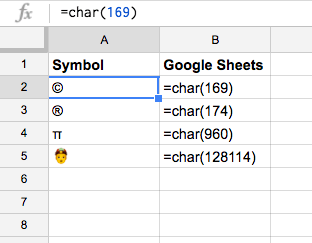 The CHAR( ) function lets you insert symbols like trademark ©, copyright ® or the number pi π. To find interesting symbols we recommend Graphemica. The functions CHOOSE( ) AND RANDBETWEEN( ) help you pick a value from a defined list. RANDBETWEEN( ) generates a random integer between 1 and 5. CHOOSE( ) helps you pick from the list of entries.